Those of you who are trying to avoid thinking about buying a Thermomix, avert your eyes now. I made butter today. It was a bit more fraught than the simple instructions may have one think. The simple instructions are as follows. Insert 600 ml of cream in the Thermomix jug. Insert the butterfly attachment, pictured below. 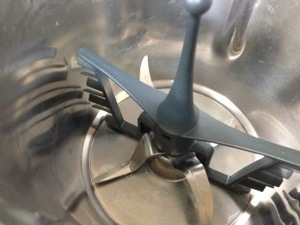 Beat until it turns into butter, then rinse with cold water. Well, that sounds ridiculously easy. All I need is some cream and receptacle in which to place my creation. 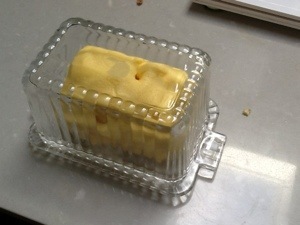 The chain store House actually stocks butter dishes, so I purchase on of those. I could hunt down the butter dish my Nanna used to keep her butter in, she never put it in the fridge, but knowing her she probably got it from Copperart, so wouldn’t think it would be worth it. And some cream. I don’t want to use just Dairy Farmers, even though my local IGA sells it in two litre jugs, I feel like I could just buy Allowrie butter instead and save myself the trouble. I also don’t want to use the extra fancy small pots of high fat cream you can get either, because then the price starts getting a bit ridiculous. 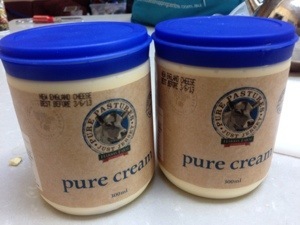 I found some cream that met my specifications at Harris Farm for three dollars a pot. Well now, into the jug and we’ll have butter in no time. I turn it onto speed four and prepare to wait the one to three minutes suggested in the recipe, when at about twenty seconds the machine starts making noises like a mouse being eaten by a not very hungry cat and stops. Err, it says. I have a look in the jug. I’m pretty sure that’s not butter. It’s very thick whipped cream, which would be excellent if I were hosting a Devonshire tea. I try ringing my sister, who makes butter regularly. No answer. I breathe deeply and try to gather my thoughts by booking a large amount of weaponry for the Moose’s upcoming fourteenth birthday party. I look back in the jug, it’s still whipped cream that’s almost the consistency of butter, but I can’t kid myself that it is. I heave another sigh and decide to go on to the next step, which is to remove the butterfly and add five hundred grams of cold water and beat for a few seconds and speed four. This gives me a jug full of thin cream. I’m jolted back to third year inorganic chemistry prac. I’m holding a centrifuge flask while a demonstrator looks at it with a puzzled frown. Everybody else’s flasks are lined with sparkly orange crystals. Mine is empty except for a thin green smudge around the equator of the flask. “I’ve never seen that happen before”, said the demonstrator. “And I’ve been watching what you were doing because I know what you’re like”. That incident did cause me to go on to study a branch of chemistry that didn’t involve handling actual chemicals during the course of which I met the man who later became my husband, but that’s not helping me make butter. I fetch a third sigh and put the butterfly back in the jug. 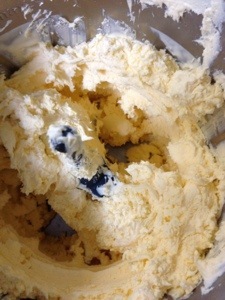 I crank the speed up to four and peek in the hole in the lid to see the thin cream swirling about. After about a minute the crossed fingers pay off and it starts getting chunky. At about two minutes I can see that I’ve definitely and against the odds made butter. I poured off the buttermilk, added another five hundred millilitres of cold water, removed the butterfly and zapped it for a further ten seconds. Poured off that water too, but I don’t think I’ll keep that. 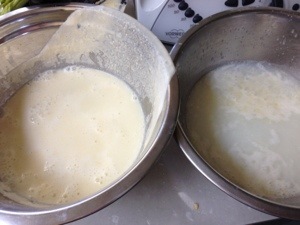 Buttermilk on the left. I poured it through the basket that comes with the jug. 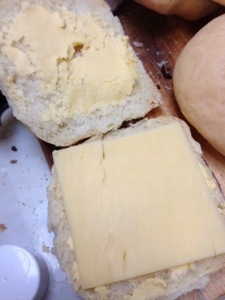 What you do next is gather the butter up as if its dough and start squeezing the water out. It’s rather enjoyable and I’m sure it’s good for the skin. You quickly have a surprisingly yellow log of fresh butter. I weighed mine and it’s 400 grams, so that makes the price of it slightly better than Lurpack and far less air miles. I don’t think I’ll use it in biscuit making because I’m not sure of the water content. I did put some of it and some of the buttermilk into a banana cake just now, and that seems to have turned out rather excellently. I finally got on to my sister who said her experience has been rather mixed in the butter making department too, and also that she adds oil and salt to hers and uses it as sandwich butter, which sounds like a very fine idea. This batch I’ll test out in various guises, and if it’s no good for baking it’s still not to late to blend it into something more spreadable. I tell you what I’ve discovered already, she said incredibly smugly, it’s very good on a homemade roll with a slice of cheese. couldn’t believe the title of your blog! 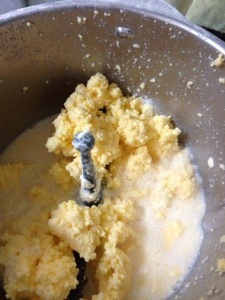 i have owned a thermomix for years but until yesterday never made butter. i have frozen my effort, but i failed to get anything that looked rich enough to be called buttermilk. loved the post! Thanks! It was fairly nerve wracking, but I’m very pleased with the result. I think I will try it in baking after all, I’m trying to wean myself off Danish butter.